Although Coca-Cola Gum hasn’t been marketed since 1925, it hasn’t been forgotten by collectors interested in advertising memorabilia and Coke items. In fact, anything related to Coca-Cola gum is desirable right down to the wrappers. That is, if you're lucky enough to find them. For instance, this advertising cutout is reported by Morphy Auctions to be even more scarce than a smaller cutout in the same basic style. This example is pictured in Petretti's Coca-Cola Collectibles Price Guide, and it is considered important and rare to Coke collectors. The strong color remaining, with little fading or discoloration, adds to the value of this example. Although the piece exhibits a clean break line at the neck, light soiling, and some minor edge and corner wear, it’s still a prime example commanding the attention of avid Coca-Cola advertising enthusiasts. This 29" x 22" piece sold for $55,200 (not including buyer’s premium) at Morphy Auctions Premier Advertising sale held on Oct. 4-5, 2013. 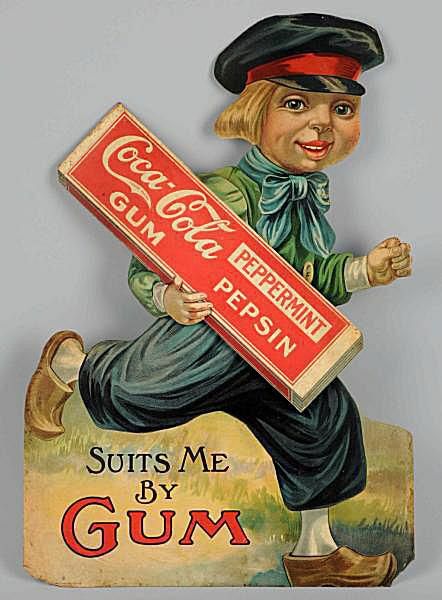 Dutch boy advertising cutouts similar to this one have been reproduced, along with the Dutch girl that goes along with it. The girl dressed in traditional Dutch clothing is holding a pack of spearmint Coca-Cola gum. It should be fairly evident looking at the back of the repros that they are not old, but be aware that they do exist before getting too excited about finding what you believe to be an original. Continue to Page 2 to see another rare sign from 1903. Coca-Cola gum memorabilia is almost always desirable to collectors no matter how big or small the item might be. The signs featuring one of the first "faces" of the Coke brand are no exception. This cardboard Coca-Cola Gum sign features model and actress Hilda Clark. It is heavily embossed, elaborately decorated, and in excellent condition for this type of ephemera. Close examination of this piece shows minor edge bends, marks and two very short edge tears along with five tiny holes where tacks were used to display it at some point. The colors are beautiful with only minor nicks and rubs on the face. The original easel is also still affixed to the back. Even with condition issues, it is considered to be very good to excellent for its age. Rarity also adds to the value of this item. Measuring 20” x 16”, this example is also depicted in Petretti's Coca-Cola Collectibles Price Guide. It sold for $45,000 (not including buyer’s premium) at Morphy Auctions Premier Advertising sale held on Oct. 4-5, 2013. When is a single stick of gum worth more than $1,000? When the label says "Coca-Cola." This gum hasn't been made since 1925, so anything relating to the product is quite desirable among Coke collectors and advertising enthusiasts alike. This includes the actual gum in an original wrapper which is rarely found today. This 3-inch stick of gum was made in the 1910 to 1917 range by Franklin Manufacturing Company in Richmond, Virginia. Even though it is discolored due to age, this piece of wrapped gum is considered to be in top condition from a collecting standpoint. Never used or opened, and complete with the original paper wrapper and inner liner, it has only mild soiling and very little wear to note. It sold for the whopping sum of $1,300 in September of 2011 through Morphy Auctions. That is impressive, no doubt, but it is interesting to note that it fell short of the pre-auction estimate of $2,000-3,000. Nevertheless, the moral of the story is that even a single stick of gum can be very valuable when it bears the ubiquitous Coca-Cola brand. When prices for collectibles rise, reproductions are sure to follow. Since Coca-Cola gum hasn't been made since 1925, and there are far more collectors seeking related collectibles than there are examples available to satisfy demand, sometimes reproductions are more readily found. This photo shows a smaller reproduction ink blotter above for comparison with an authentic 6-inch example below. The lot sold for $350, which is a formidable sum for a single ink blotter, in December, 2014 at Morphy Auctions. If you're contemplating adding one of these rarities to your Coke collection, make sure it measures up. Which Spatterware Colors are Worth the Most?